Life in the Cascades of Central Oregon is full of adventure, but it can be tough on skin! Our goal at Oregon Body & Bath is simple: We make life a little softer. We spend our recreation time hiking the High Desert, rolling down singletrack, paddling the river, and skiing the backside. Our skin gets chafed, scraped, sun-kissed, wind-burned, frost-nipped, dried out, dehydrated, cracked, prickly, itchy…you get the idea. What’s a body to do with all this dryness? At Oregon Body & Bath we offer the best products to clean off the dust of the day, hydrate your skin, and pamper yourself into a restful night’s sleep. Deeply hydrating lotions, locally made soaps, shea buttery bath bombs and body butters to quench your skin; fragrant candles, home scents and diffusers to welcome you home, and the softest pajamas and robes to ease you into sweet dreams. 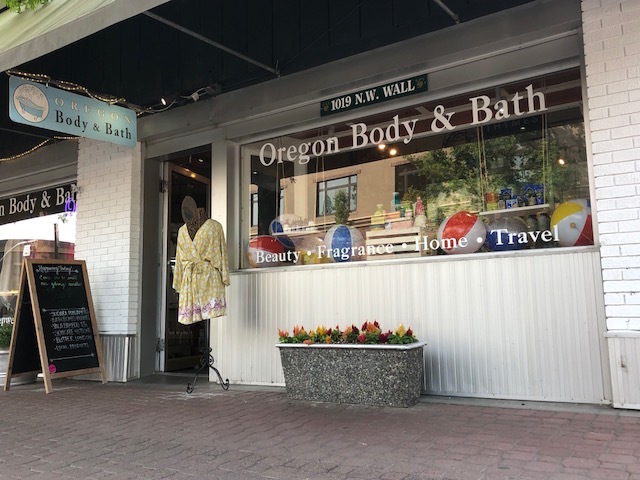 Oregon Body & Bath has been a local, independent and unique boutique in Bend since 1992. We love our location in the historical Metropolitan Barber Shop Building, which was built in 1924 and still features the original wood floor and exposed brick. We carry a wide range of body and bath products, and especially love our local lines, including DANI Naturals, Bend Soap Company, Lava Love, and Mrs. Greenbalm. As much as we love our products, it’s our customers that make the best part of our day. Stop in and see us, and browse through the shop…there’s always something new to find.